From poverty to wealth, a small school to huge conferences, Mawali to the U.S, William Kamkwamba’s journey is beautifully documented in “The Boy Who Harnessed the Wind.” Written by William Kamkwamba and Bryan Mealer, this book tells the moving story of a child living in an impoverished country and improving the situation in his community despite incredible odds. William’s quest demonstrates that even a young person, with little to no education or money, can make a positive change in the world. Set in Malawi in 2006-07, this book documents William’s journey to build a windmill and bring electricity to his family. Armed with little more than some scrap metal and old science textbooks, William and his friends assemble a working windmill, improving their lives and the lives of those around them. Before he even knows it, the outside world has learned about his accomplishment, and he goes on a tour of the world, from New York City to TedGlobal2007. The last line of William’s speech at TedGlobal really just sums up the story. “I try, and I make it.” It shows that with enough effort, enough determination, it is possible to make a positive change in any circumstances. Bryan Mealer’s style of writing turns an already intriguing story into a true work of art. He wrote this book from William’s perspective, and in doing so left out all of the negative opinions and depressing personalities of the people around him. This book is also somewhat of a foreign language lesson, because Mealer writes English definitions alongside all of the African words. It is really easy to pick up a basic learning of Chichewa while you read. 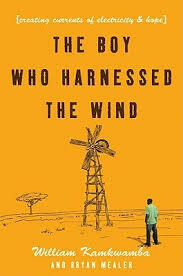 All in all, The Boy Who Harnessed the Wind was easily the best non-fiction book I have read in a long time. The bits of technical information scattered throughout, like the differences between lead-acid and deep-cycle batteries, really appealed to me. Community service lovers will also adore this story because of William’s determination to improve his community and his positive outlook on even the worst situations. This story is filled to the brim with great life lessons too, like to never give up and to make the best of what you have. Even if you don’t like science or community service, these amazing mottoes will make this a spectacular read. I’d be hard-pressed to find somebody who didn’t enjoy this book.